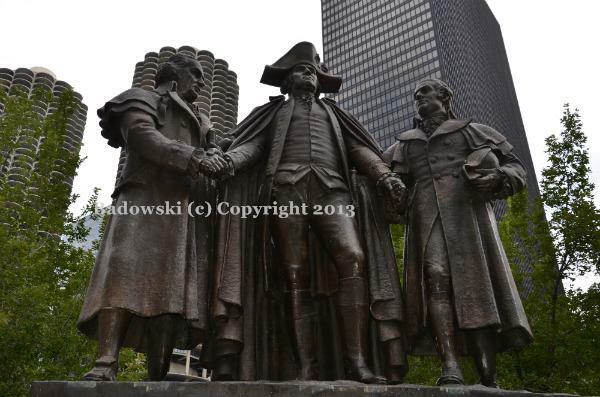 The first statue ever to depict George Washington with other individuals, the concept for this bronze monument originated with Barnet Hodes, a lawyer of Polish-Jewish heritage and member of the Patriotic Foundation of Chicago, the not-for-profit organization that commissioned the work. Hodes became interested in the career of Haym Salomon, a broker working with foreign currencies during the 18th century and active supporter of the Revolutionary effort, sometimes underwriting some of the costs himself. Also of Polish-Jewish heritage, Salomon and his contributions to the development of the United States were often overlooked in history books and Hodes wanted to create a monument that commemorated the spirit of cooperation between civilians and soldiers during the Revolutionary War as well as the cultural pluralism of the country. The Patriotic Foundation approached Lorado Taft about creating a model for visual presentations, which would help with fundraising efforts as they intended to pay the $50,000 cost through donations from citizens of Chicago. Taft suffered a stroke in his Midway Studios (on the University of Chicago campus) while finishing the model and he died on October 30, 1936. During his many years as a teacher and lecturer, Taft had worked with a number of students and associates in the Midway Studios and one of them, Leonard Crunelle, was called upon to complete the monument after Taft’s death. Standing more than 11 feet tall, Washington is shown wearing his Commander-in-Chief campaign clothes with the Continental three-cornered hat. To his right is Robert Morris, businessman and eventual Superintendent of Finance for the Continental government (1781-84), making him, essentially, the country’s first Secretary of the Treasury. Together with Salomon, both of whom were residents of Philadelphia, Morris helped bring about the creation of the Bank of North America in that city. The three figures exude determination and a sense of cooperation, standing together with clasped hands. In addition to acknowledging the contributions of businessmen and individuals with different backgrounds to the Revolutionary effort, the monument stood as a refutation of Nazi ideology. Dedicated on December 15, 1941 (Bill of Rights Day), the work was described as a “great triumvirate of patriots” by President Franklin Delano Roosevelt. First Lady Eleanor Roosevelt stated that it symbolized “a fundamental fact of American tolerance.” The massive base features a bronze, bas-relief plaque that depicts an assemblage of people of various professions, ethnicities and backgrounds, gathered beneath a seated Goddess of Liberty with outstretched arms. The work is sometimes called the “Heald Monument,” due to its former location in Heald Square, a spot named in honor of the Commander of Old Fort Dearborn, Nathan Heald.